Home » Mets 2008 Games » Free Peanuts! Not sure if you caught any of the “Playing for Peanuts” episodes while they were running on SNY — you might have seen them at odd hours or during rain delays. Long story short, you can’t see the documentary of the South Georgia Peanuts, starring Wally Backman, on TV anymore. But that’s a GOOD thing. Because now you can download “Playing for Peanuts” and watch it anytime you want! Producer John Fitzgerald has pulled the show from the corporate-controlled airwaves and cable channels and put it into the hands of fans — for FREE. You know I rarely “push” products on this blog … so when I do, it’s because I believe very strongly in it (or I’m being paid a handsome amount of cash …. oh wait, that hasn’t happened yet). That said, I give “Playing for Peanuts” a full recommendation as a “must see” for any baseball fan — serious or casual. In fact the “Peanuts” episodes should be sitting on your shelf right next to your Ken Burns’ Baseball DVDs. 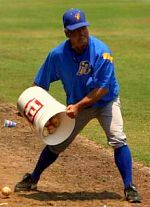 And it doesn’t matter whether you are a fan or not of Wally Backman, because the story is really about what it’s like to be part of an independent minor league baseball team. Oh, did I mention you don’t even have to buy the DVDs, that the episodes are FREE ? I did, and as a MetsToday reader you can watch them for free by visiting the Playing for Peanuts website and entering the access code 6CJS9Z6GT2. Or I encourage you to visit the Playing for Peanuts blog for more free episodes, alternate versions of “Take Me Out to the Ballgame”, and other details and downloads. Next Carlos Beltran for Manny Ramirez? thanks for the tip. I checked out the 1st episode. Pretty cool.